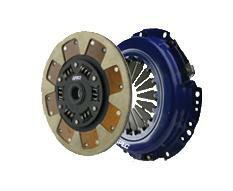 The SPEC stage 2 Clutch Kit Features segmented or full faced pure Kevlar disc with steel backing. This lining features excellent drivability like the stage 1, but offers slightly longer life and higher torque capacity. The hub is double sprung with spring cover relieves for flexibility and heat treated components for strength and durability. Best for street, drag, pulling and autocross. I got this because I wanted the daily driving of an OEM full face disc clutch, but wanted some more power. The Kevlar plates on it act like a 6 puck and I can launch the hell out of my 240sx. I love this thing!